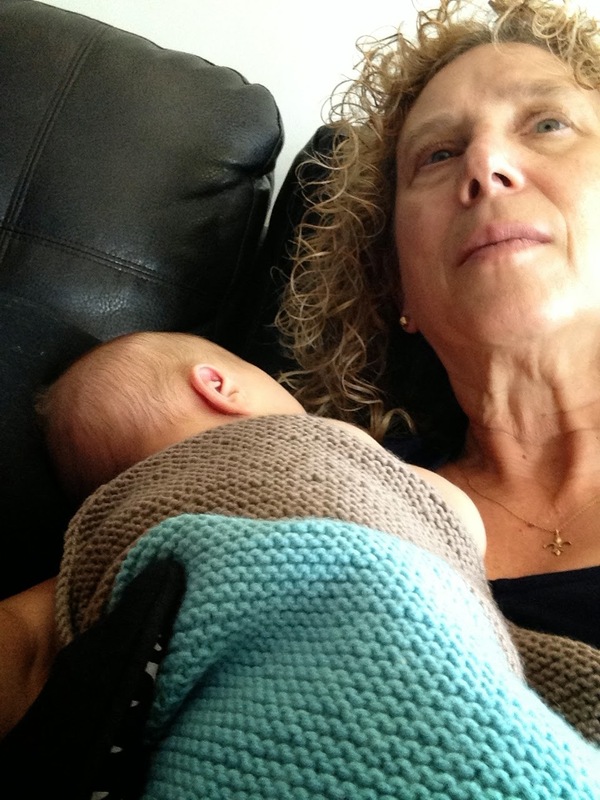 materfamilias writes: Seeing Ourselves as Others See Us. . . Age and All! Seeing Ourselves as Others See Us. . . Age and All! Have you seen this brilliant time-lapse sketching of a woman's life from infancy to old age? The video is well worth the four minutes' viewing time -- magical! Or have you looked at this New York Times article by Susan Minot about the glorious series of photographs taken by Nicholas Nixon of his wife and her three sisters, every year for four decades? Aging AS beautiful. . . I was pleased to stumble across both of these as I was deciding how, or whether, to post a few photos I took this summer while my newborn granddaughter slept and slept and slept on my chest and I played with my iPad, having never known how to take a "selfie" with it before. . . . Honestly, I recognize that context is so important here, and priorities shift in the face of the precious new, all that burgeoning sweet potential, but I have no qualms about those moles, the naso-labial creases, the neck I'm supposed to feel bad about . . . . The eyebrows are scruffy, the neck is wattle-y (and, oh yes, there's a brastrap showing inappropriately). . . .
And still, I'm happy enough. Happy enough. Happy. Even earlier this summer, as Nola sat on my lap while we wandered into Narnia via the foxed, slightly musty pages of one of her mother's childhood books, her fingers traced with considerable fascination the swollen branching veins that lend a rich topography to the back of my hand. She followed a stream from my little finger to the bony centre of that hand, then pivoted to follow another stream up between ring and middle finger, reversed to head down a larger tributary into the dip at my wrist, then up to where the river plunged underground somewhere under the forearm. And then she moved to my other hand. Played the same game. It was distracting, but it reminded me palpably of my own long-ago fascination with the loose plumpness of my maternal grandmother's upper arm, the velvety-soft delights of the wrinkles there, their tiny ripples. . . The memory feels anchored to my 5-year-old self, perhaps 6, and I can sense a mixture of annoyance and amusement and fondness emanating from my Grandmother, can vaguely remember some self-deprecating comment as she distracted me with a cookie or an errand. She wouldn't have been much older than I am now, mother of 10, grandmother by then to 35 or more (yes, really! I have something like 50 maternal-side cousins now). What would she have thought if one of her adult daughters had taken a picture of her, lounging over breakfast in the sunshine (that is very hard to imagine her doing, I must say) just because said daughter thought her mother looked beautiful? Would she have felt the faintest flicker of annoyance, suspecting an element of . . . what? being patronized? Surely not beautiful. . . this hair, unstyled yet in the lazy summer morning, . . .Are you mocking me, daughter, you beautiful young woman? And yet I know this girl well, must look again, see myself through her eyes. . . . Even if it's taken me weeks and weeks and weeks to muddle and ponder and post. . . I don't need to look beautiful, you know? I think it's important to stress that. I even think I mean it, know I mean it, although I surely like to look attractive. As in, something about my look will attract, will engage, will hold my fellow beings' gaze long enough so that we can begin to interact on other less superficial levels. But looking beautiful, as conventionally understood, I don't need. I need to see the beauty in myself, though, and to accept it when and where others see it. In my age-risen knobbly veins, in my crazy curls, in something about my absorption in a book on a sunny morning. I went looking in a favourite book, Joy Kogawa's Obasan, for a passage I thought I remembered, a passage that parsed the gap between the way the narrator's Japanese-Canadian forebears appeared to viewers of their photograph and the way she remembered their physicality. I've flipped through the pages again and again, stopped at the post-it notes I've littered the pages with, and I can't find that section. Did I create it from my own understanding of the novel and my memories of my grandmother, my own memories of how often photographs fail to capture the fullness of a person? No matter. While searching for it, I found this description of the titular Obasan, the narrator's aunt, the aunt who raised her after her family was split apart by Canada's internment of the Japanese during WWII. Obasan is now old, the narrator, Naomi, muses, as is her house: Squatting here with the putty knife in her hand, she is every old woman in every hamlet in the world. You see her on a street corner in a village in southern France, in a black dress and black stockings. Or bent over stone steps in a Mexican mountain village. Everywhere the old woman stands as the true and rightful owner of the earth. She is the bearer of keys to unknown doorways and to a network of astonishing tunnels. She is the possessor of life's infinite personal details. I'm not there yet, I know, but well on my way. And there is beauty there. By the time I get there, I want to have the wisdom to see it! Alyson, at That's Not My Age, has been offering some wise words on ageing and on being old, via a variety of smart women. Check them out , if you haven't already. I'd love to see your feedback on anything that strikes you here, although any questions I come up with feel archly formulaic, somehow. So I'll leave the forum free for you to shape, brilliantly, wisely, as you do. And please, please forgive me for the temporary hurdle of word verification. The Spam was just becoming too much, and I hope this will throw the beasts off-track. . . . But you, you I never want to deter, so please, I'm waiting for you to vault that word-verifcation bar and chat. . .
For reasons too many to specify, I love this post. Thank you. thanks for taking time to comment, Robin. So pleased you enjoyed the post. Love this post too. I must admit that sometimes I look in the mirror and wonder who is looking back at me. Other times I'm proud to get a glimpse of myself. Your remarks about hands really resonated with me. One of my favorite memories of my mother is her hands -- I loved the veins and hills and valleys. I don't remember my grandmother's hands, probably because she never stayed still enough to study them. She was an actress, not a conventional grandmother, and she could not talk without moving her hands. Why didn't anyone tell us that aging isn't easy? It's not the health issues for me, it's trying to find out who I really am at this age. Who is this person in a changing body? Hands have their own kind of beauty, don't they? Oh I look in the mirror and see my lines and softly sagging jaw with a wattle like neck and I have to put it in perspective....I am alive. Many of my friends are not. I am comfortable and a grandmother so I do not expect to look like a 30 something woman. I guess I just don't worry that much about my face, I try to keep my skin well cared for and moisturizer but beyond that....no fillers or Botox are planned. I will be back to read what others write on the subject. Great that you shared your beautiful pictures...thank you. It's pretty obvious I don't worry about my face, although I wash it daily and slap on some cream morning and night. Try to pluck those wanton hairs when my eyesight. Hi Mater, such a lot to think about here! I was never beautiful when young, just passable, but always looked young for my age and so held on to that. However, there did come a time when I realised that, instead of looking younger than my years, I now most certainly look like a 54-year old woman, and that has taken some getting used to! Thought of you last week. I was just re-reading Joy Kogawa because I have been writing about Steveston for my writing class. I was away this week-end with my mum and I realized that I look quite a lot like my grandmother. I wondered what I would be like as an older lady. Now I know. To be healthy, active and engaged in whatever one is passionate about is a great part of life in the 7th decade. Your photos are lovely. Have you read Daphne Marlatt's Steveson book? Healthy, active, and engaged--I can live with that! I'm reading this just before heading upstairs to bed and I need time to think. There is beauty at every age, but I'm finding it hard to see in myself any more. I'll be back tomorrow, I hope, possibly with some cohesive thoughts. I am usually behind the lens and discourage others from taking pictures of me. If any do get taken, I shy away from looking at them because I completely forget what I really look like and do not recognise the outer shell. I know that I am 60 and a grandmother and that is exactly what I should look like. It is possible that I look even older but I do wonder where the benchmark comes from that defines the correct appearance for any age. Your honesty is much appreciated, and of course you look great in all those pictures. The culture tells us, in girlhood, to become beautiful, or at least pretty and then to fiercely maintain that; the real imperative is to deny all signs of age. The antidote is (supposedly) the consumption of products. I always was suspicious and now am irritated by these messages. Lately I look at candid photos friends take and wonder, who is that? There are years when I seem to look same as ever and then ones where I take, as the French say, a "blow of age". I'd like to look vital, feel energetic and keep my mobility, as well as other markers of health, as long as possible. And, I'm confused when someone titles her blog "That's Not My Age" and yet, post "wise words on aging"- but I may be interpreting the title inaccurately. I spent some time on that blog and like it; for the sole reason of its title, I had never read it. Duchesse, I've always interpreted "That's Not My Age" to mean "I am not defined by my age," if that makes sense. Thought provoking and wonderful. Living where I do I California, it almost seems a sin to age. The frightening results are plastic faces with "ropey" veined hands! My mother had a full facelift at my age. While I do take good care of my skin, I don't thnk I would want to alter my face. I'm earning it with every struggle I battle and remind myself to smile more often. Facelift are much less common here, so I don't feel as if I'm resisting the notion. It's never seemed at all desirable, quite honestly. Must be harder to think that way when so many around you are smiling tautly. You have beautiful skin, I know from having seen it IRL, and I find much more beauty in its luminous aging than I would if it had been snipped into tighter contours. My first thought from the first photo was, "I'd like to get to know her." I agree with much of what you say, except that I'm trying to acknowledge other kinds of beauty in myself, not to be so ready to deny it when others see it, just because I know I don't look like the young women in a fashion magazine. Yes, Beauty is culturally defined, but our eyes are part of that culture,no? Loved this post, Mater...(may I call you Frances instead of Mater?) As I was reading the part about Nola tracing the veins in your hand it reminded me of a passage in The Jade Peony....when the small boy Sek Lung describes his grandmother's hands, veins and all, as "magical." You absolutely may call me Frances, yes. And I'd forgotten that passage in The Jade Peony, thanks! Alyson comments below on her blog title -- your tuppence worth was very close to the mark. I am commenting for the first time...I was so moved by the pictures taken by your daughter and your accompanying words. You look lovely, and the garden setting, the sunshine, your fresh summer top, your enjoyment of your breakfast...all so pretty and summery. But it's the love your daughter feels for you, I think, that makes you beautiful in her eyes. And really, in the end, what more can we ask for? So pleased to have you comment, Georgia! I think so, too, abut the daughterly love. Its magic makes me feel as beautiful as she claims I look. Can't ask for much more than that. I love this post, Frances! It touched my heart and brought back a lovely memory. I had my last daughter at age 38, 12 years after my first and 10 years after my second, and time...and gravity...had taken it's toll. 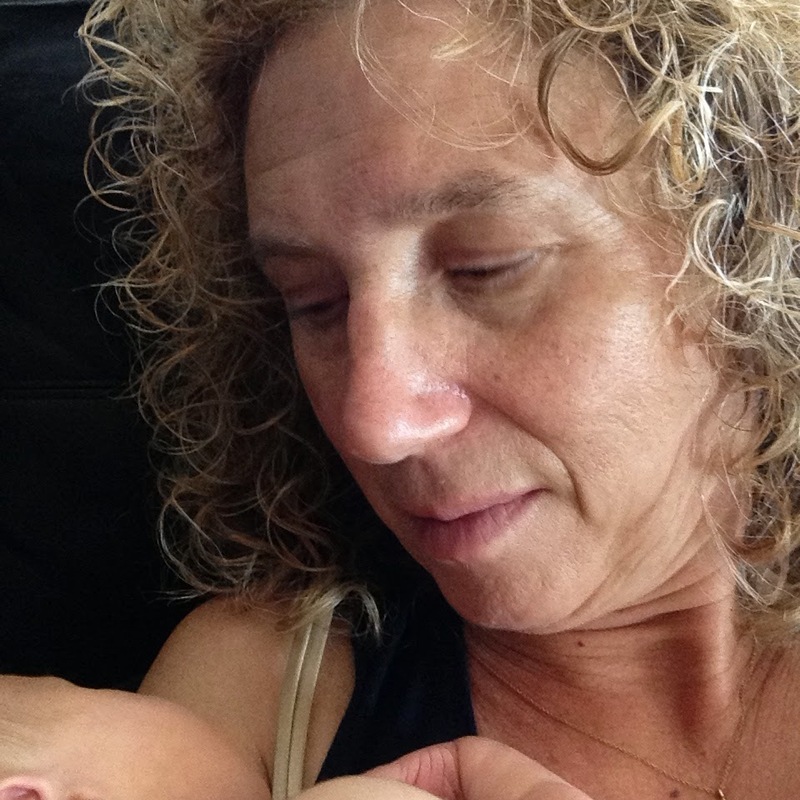 But I was determined to breastfeed for as long as my wee one wanted, as long as we were both content. That turned out to be 3 years! One day, I was complaining about my "wattle" and saying how much I would like to get rid of it, to no one in particular, when my 3-yr old cried out, "No, Mama! What will I hold onto when I'm on your lap?" She had this sweet habit of stroking the baggy fold of skin under my chin as she blissfully nursed while cuddled on my lap. It was like a splash of cold water on my face! What was I thinking?!? To my girls, I meant comfort, safety, and love. They didn't need me to be perfect, and it has taken time, but I've grown to love every freckle, dimple, and crease around my eyes. It's LIFE I see in the mirror looking back at me. And it's good. Such a sweet, sweet memory! And this is exactly what I mean. That "wattle" was absolutely beautiful to your 3-year old's fingertips, and really, why should we submit to the judgement of any other Arbiter! Your beautiful post evoked memories of my grandaunt Anna. When we were small, my sister and I used to spend short holidays in her house, full of stange adventures, strange smells and strange habits. Aunt Anna used to wear her hair done up in a complicated bun (or rather roll) at the back of her head, and it was a special treat for us when she consented to let us watch her do her hair in the morning. She would come to our bedroom and sit down on one of the beds and brush her long white mane, and we watched in fascination as she set to work, her mouth full of hairpins, plaited and pinned the strands here and there and transformed into her usual dignified everyday self. (And all without a mirror!) For my sister and me this long white hair floating down my grandaunt's shoulders was incredibly beautiful, whereas we didn't even notice her hunched back or flabby arms. I think most childen's concept of beauty is very open to difference and individuality, it is only later in life that we get caught up in all those ideas that reduce beauty to a slim body, smooth skin and everlasting youth. That's a marvelous, marvelous image. I can just see you two little girls, transfixed as you watch this stunning white hair form a mantle over your great-aunt's shoulders and then be braided into daily neatness. Wonderful! This is a fantastic post, Frances. You write so beautifully & that's a lovely passage, I must read Obasan. And thank you for mentioning my blog. Regarding the title - you're absolutely right. It is supposed to be tongue in cheek, a comment on the fact that ageing is not what it used to be. We are so different to our mother's generation; midlife, and beyond has been completely reinvented. I guess, That IS My Age might have been a more obvious title but I just liked the sound of That's Not My Age. And thought it was more fun. I think we're all in agreement that at the end of the day, age really shouldn't matter, at all. Obasan is an important book in Canada -- it helped lead to redress for those Japanese-Canadians interned during WWII. A beautiful, poetic novel. Such beautiful photos, Frances, and lovely post. I can't help but get sappy. Who gives a f*ck about wrinkles in the face of that kind of love? OK, sappy AND profane;). Really, with a partner and family who love us, and find us beautiful and get pleasure and comfort in our bodies, don't we need to do the same? I've written a fair amount about aging as a formerly pretty woman. I've gone from being a pretty woman showing signs of aging, to an aging woman showing signs of pretty when I make an effort:). I have to stop, and mourn a little, every time I bump one more landing down on age's staircase, but it doesn't last long. Life looks different at ever level, and so far it just takes a while to adjust and enjoy the new perspective. I am sure that real aging, the kind that's not for sissies, will be different. I just don't know how. I was reading at Time Goes By, and Atul Gawande's book on mortality is reviewed, and a video of an interview with him posted. Very good to read in conjunction with this post. End of life is probably not all that much about how we look, in the end:). In the end, I'd love to think that neither is beauty all that much about how we look, although it's certainly where are thoughts go first, at that word. . . I look forward to reading the Time Goes By post and perhaps finding time to read Gawande's book. My time with my mother, at her end, is something else I'd like to talk about in terms of beauty and ageing, but I'll have to work up to that. Age's staircase indeed. I find that tripping over the 60 threshhold has made a surprising difference, although that might also be because that coincided with my orphan status as I lost my last parent (and a father-in-law) all in the same year. These are all such wonderful, rich responses, and I hope there are more on their way. I think I'll gather up some of your words, and my responses back to them, into another post, if you don't mind, rather than answering one by one here. I'd love to see the conversation continue in a spot more are likely to read. But I'm super busy until the big event I'm coordinating happens on Thursday evening. This weekend, though, I hope to post something. Meanwhile, I will be reading your wonderful comments and thinking about them. Thank you! I look like the person who has lived my life, you look like the person who has lived yours ... and the more living we've done the more beautiful we all get. You know, when the thumbnail of that first photo appeared in my feed, my first reaction was "oh, how lovely!" Yes, beauty apart from the cultural imperative, apart from the denial of life's course. And lovely. I really like that series of photos of the four sisters. You get such a sense of their strength and love. I think of photos of Georgia O'Keefe as an older woman, how strong and un-compromised she appears. No apologies. I wonder if she felt that sense of self she conveyed. I think it's this middle part that's the hardest, where the changes start to accelerate and we sometimes don't recognize ourselves in the mirror, but before we can say "I am old" and claim all of the victories inherent in that. Isn't that a wonderful series of portraits?! Yes, to your last paragraph. For me, something about moving over 60, as well . . . I can't say enough about this fine post - I will re-read it often, both to enjoy the fine writing and to revel in your sentiments. Your commenters inspire me as well. Thanks to all. You're so kind, Marsha, thank you! And I agree, the commenters really are inspiring. You look splendid , enviably content . ( I'd say comfortable but that might sound insulting , somehow ! ) And that has to do with mind-set eventually ... though surely it helps to start off with an attractive face and a cuddly baby . "I'm 27 again " she crowed " I'm doing what my father did , these days . You should try it . He was 19 when he died "
I realised she wasn't talking about crocheting , but about reversing your age . I'll try it when it doesn't make me 76 . Ha! That's a great story! And yes, the method works best in the first few years of each decade! At 61, though, I'm not sure I'd be willing to reverse -- 16 had its own challenges! Beautiful photos! Next week I turn 57. My 40th wedding anniversary is coming into view. Pretty is not a word I've ever applied to myself, (and at times I've been made to feel that lack by societal pressures) but now I'm aiming for beautiful. I'm content, fit, healthy and loving where I am in my relationships and responsibilities. Yes, I want to present myself well, look good in the context of who I am, though I find that looks (whether mine or yours) have very little to do with my definition of beauty. I love this! And yes, Beautiful is more sustaining and sustained and sustainable than Pretty. Pretty seems more firmly in the realm of the visual, And it seems smaller. Beauty can get closer to the Sublime (which is why so many poets and philosophers through the ages worked to parse the difference between the two, arguably). There is so much I wish I could say about this post, but most of it has been said already. It is lovely and beautiful on so many levels, as are the photos you have posted. I've always thought that beauty in some true sense has nothing to do with "beautiful" in terms of the more superficial definition of that term. Anyway, the love is obvious, as is some intangible spark of life and intelligence. Thanks, Mardel. It's a post that I do feel good about, I got close to saying (and thus seeing) what I was thinking, and the comments are so rich and varied.